In the winter of 2017-18 1175 trees and hedge plants were planted at Viveka Gardens Yoga Farm. This was under the Woodland Trust’s More Trees scheme, in which the Trust gives a 60% grant for the cost of the trees, stakes and guards. After an assessment visit a mix of plants was chosen, all British native or naturalised species. These would cover approx. 0.5 hectares on the top section of the larger field at Viveka Gardens. The trees were delivered on November 25, heeled in the next day and gradually planted by March 24. Over forty work exchange volunteers and karma yogis, friends and community contributed to the planting. Woodland creation is one part of the bigger vision for Viveka Gardens, a retreat place where community and visitors can ground themselves through yoga practices, food growing and nature connection, and so connect with their true self to embody peace and unity. 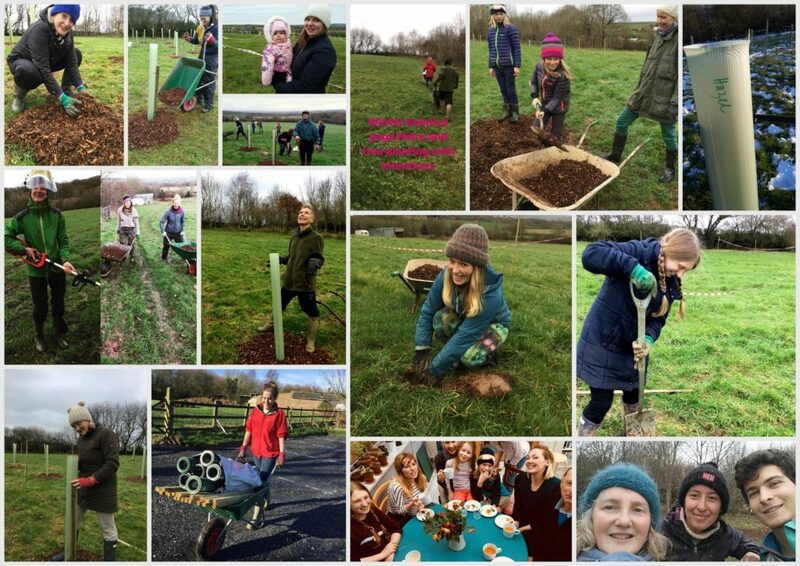 Stakeholders: this report goes out to volunteers, The Woodland Trust, neighbours, The Harvest Workers Coop (Okehampton), and via the Viveka Gardens email newsletter to past, present and future visitors to Viveka Gardens. There is a mix of British trees suited to the conditions here, a slightly acidic loam with wet flushes. All are native except the Sweet Chestnut, Roman introduced. The plants were bare rooted whips, that is to say plants two to three years old up to a metre tall. The trees came from Thorpe Trees in Yorkshire, all from native collected seed grown by volunteers. Tree Species: Alder, Aspen, Crab Apple, Field Maple, Hornbeam, Small Leafed Lime, Oak (Quercus robur and Q. petraea), Rowan, Scots Pine, Silver Birch, Sweet Chestnut and Wild Cherry. Ash is already on the property; the Woodland Trust no longer supply it due to likely failure from die-back disease. Small Leafed Lime was a dominant species in the British Isles until the later Iron Age when it was overused as forage and slashed and burned to make fields. It is now rare but being brought on to ‘replace’ Ash. Shrub species form an under layer: Elder, Hawthorn, Holly. To supplement these species, gorse seedlings brought in with a lorry full of woodchip have been transplanted. In addition, woodbine, ivy, winter celandine, primrose, dog’s mercury and more will be transplanted from within the property, and it would be good to plant other understory species such as the large shrub guelder rose which supports dormice in particular, and Butchers Broom, a shade loving plant; snowdrops, bluebells and anemones too. The hedgerow is 50% Hawthorn with Blackthorn, Crab Apple, Dogwood, Dog Rose, Spindle, Cornus, Field Maple, Hazel and pedunculate Oak. 100m of hedgerow was planted along two margins. Studying the site map and aerial photos, an outline plan was sketched. The site was marked out with stakes to form planting sections, glades, and paths along naturalistic lines, in the end done following mowing lines and tracing footsteps in the dew that marked contours quite intuitively. The Woodland Trust provided trees planted at an average density of 2.5m apart, but spaces were left to create glades that make habitats for flowers and wild grasses. Groups of same trees were planted in some areas to help them establish, to avoid being outcompeted by faster growing ones. Oak grows slowly, field maple fast, for instance. 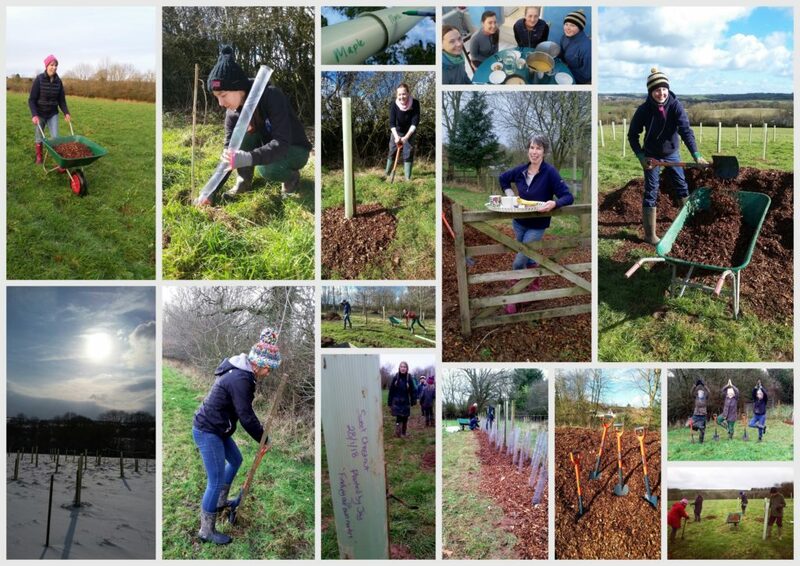 The coppice species – hornbeam, sweet chestnut and hazel – were planted in coops (sections dedicated to pole production), as well as interspersed with the general planting with where they may become trees or be cut to stay as understorey. The wood margins have shrubs to create graded woodland edge which encourages wildlife such as butterflies, bats and birds. The long open face of the woodland has a scalloped shape to increase woodland edge habitat, and to make suntrap pockets for sitting in. The choice and placing of plants took some inspiration from the Celtic Ogham which is a lettering system based on native plants, Holly is tinne, and so letter T; Hazel, coll, C. Associations based on the Celtic year of solar and quarter festivals, and traditional or felt qualities ascribed to the various trees informed planting. For instance, one of Rowan’s attributes is as a supporter of self-inquiry and meditation. At the winter solstice a retreat group planted a grove of Rowan. Another example, is the putting plants from the Rosaceae family – cherry, apple, rose, hawthorn – which have a link to heart energy in the south west. As with yoga, the planting works on three different levels: physical, mental and subtle. So on the physical level it’s about the body of the trees, the habitats and materials (coppice products and firewood) they provide, how we take care of them and how they interact with the environment. On a mental level it’s about the space they provide for recreation, the beauty and the inspiration they give. And on a subtle level it’s about the prana, or vital energy, we can share with them. Have you noticed how being near trees makes you feel good? On this level it’s also about the relationship between the trees’ spirits and ours. The land was prepared by topping, that is to say, mowing the grass in October at the end of the growing season. Competing grass where the hedgerows went was strimmed. The trees were planted in a letter box sized hole made of two cuts of the spade, the soil carefully crumbled and infilled around the roots, and then pressed in firmly with a boot. They have staked guards to prevent ringing (eating bark around the base) by rabbits and hopefully nibbling of leading shoots by deer. We then put a square metre of woodchip around the base to suppress competing weeds. Hedge plants are in double rows, each 30cm apart and staked with canes and transparent spiral guards. ‘It’s a good thing to plant trees. A planting project like this supports the beginning stages of Viveka Gardens, and it is wonderful if you can be part of that. The land’s plant, animal and people ancestors seem to be with the change of this little but beautiful bright field. A mantra or prayer can be said as you plant your tree(s). You can bring your own or share a traditional yoga or other blessing. If you want to remember someone with your planting you are welcome and we can tag it if you like. We are also ancestors in the making so if you would like to remember some joy or sorrow, dream or wish as you plant, be it personal or for the world, you are welcome. With this planting we honour the geology of aeons past, the millennia of mixed farming human use and re-vision pasture, peaceful and whole. Some of the team added notes to the planting sleeves, a dedication or reflection. An area of much research in the planning phase was to source the mulching woodchip. It is important to suppress competing weeds while the young trees establish. Advice is to use glysophate weed killer – not an option with the intention to become a vegan organic farm – or to use plastic matting – expensive, wasteful and no doubt would contribute to the issue of plastic micro-particle pollution on the planet. Woodchip is not only biodegradable but also yields soil biodiversity enhancing organic matter and nutrients. In addition, it inoculates the land with fungal mycelium, an underground network of threads that can stretch for miles bringing nutrients from other areas. The network can link this new woodland with older neighbouring trees and hedgerow plants through their mycelium. In this way landscape is linked. It was a delight to source the woodchip from Fingle Wood on Dartmoor, managed by the Woodland Trust, so inoculating the land here with some Dartmoor magic. Trees attract not only birds, insects, fungi and other plants to live on them, but also a wide diversity of soil life such as bacteria, fungi, all sorts of other micro-organisms, as well as macro soil organisms such as worms, beetles, woodlice and so on. Badgers, foxes, voles, hare and rabbits already have tracks across the field and are sure to enjoy this new woodland in due course. There is already abundant birdlife. Certain tree species support less common insect species; alder seeds support goldfinch, for instance. The field already has some quite good plant and insect diversity (as anyone who lay down in the buttercups or ladies smock last summer can remember, and a great range of butterflies as the grass ripened), and the presence of so much buttercup shows the land has not been ‘improved’ for quite a while. The aim is to build on this richness of life. I am currently looking for a group or college that may get involved with ongoing measuring of biodiversity. Over the next 2 – 3 years, while the trees are establishing, cutting of grass and pasture weeds around the trees will be important. Having been planted with love and attention and careful inspection they will make a canopy even within five years. Tending with a loving gaze helps a lot as any gardener knows. Even while the trees are just little whips, contemplation is fulfilling. We look forward to enjoying the mystery of the woodland. A big thank you to everyone who put on wellies, barrowed mulch uphill and generally mucked in, or supported in other ways. Thank you for your blessing with this work, and may you be blessed by this woodland as it grows. You are welcome to return anytime.